Suppose I have an account worth 400,000 , of which 300,000 I want to hold in LIQUIDBEES.which is around 300 units. What are all the taxes + etc involved in entering and exiting this order ? All charges for Liquidbees are the same as that of delivery trades, except that there is no STT charge as liquidbees is not considered a security, no brokerage as its a delivery trade, and no entry/exit load as this fund is traded on the secondary market. Charges for liquidbees are transaction charges of 0.00325% on turnover, 18% GST on transaction charge, SEBI charge of Rs.15/crore and stamp duty as per state of correspondence address. While exiting the liquidbees from Demat, a DP charge of Rs.8+GST is charged. 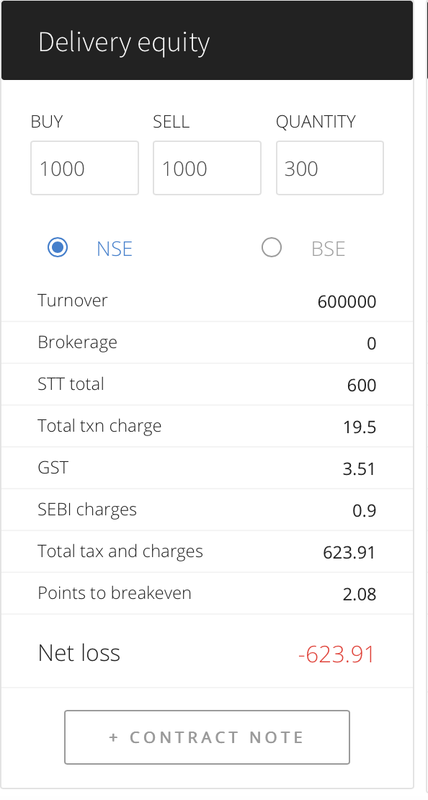 Here is a screenshot of the brokerage calculator , if I’m to keep 300 units of LiquidBees in my account. As you said , STT is not charged here . I would be paying a total of 23.91 rupees to enter and exit this trade. Plus stamp duty as per state of correspondence address + DP charge while selling units. What if we do intraday in liquidbees? I mean, if I sell some units of existing liquidbees from my account in morning & buy back before market closes? Will it attract any intraday brokerage charges? Hmm, I assume if you sell liquidbees and buy it back on the same day, then intraday charges will apply because it was an intraday trade. Need to confirm this one. Also, I would like to add to the reply that the DPs has waived charged when debiting liquidbees… I have found that this is in fact the case when selling liquid bees. Glad that u didn’t bought 300 units otherwise STT would have given u a good shock. There shouldn’t be any STT levied on LIQUIDBEES. Also would like to get confirmation on other charges applicable on a LIQUIDBEES transaction as mentioned by @Srinivas above. Ok. Thanks for the clarification. Maybe @karmar123 should check the charges again and reply if it was indeed STT on liquidbees or something else. Hi @siva can you please tell me what is the brokerage and other charges applied if LiquidBees is traded intraday. i.e. suppose I already have 100 units in my Demat account. I sell 10 units in the morning and buyback all 10 before market close. Will brokerage of 40 Rs be applied to the transaction since it was a intraday trade. you please tell me what is the brokerage and other charges applied if LiquidBees is traded intraday. i.e. suppose I already have 100 units in my Demat account. I sell 10 units in the morning and buyback all 10 before market close. Will brokerage of 40 Rs be applied to the transaction since it was a intraday trade. 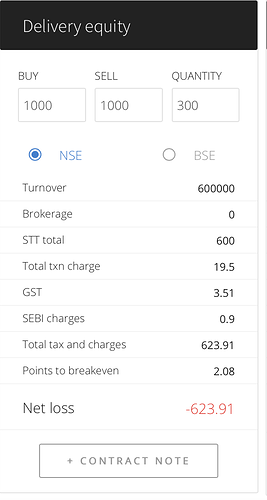 Yes, this is considered as intraday trade and brokerage is applied, can check how much is the brokerage here.